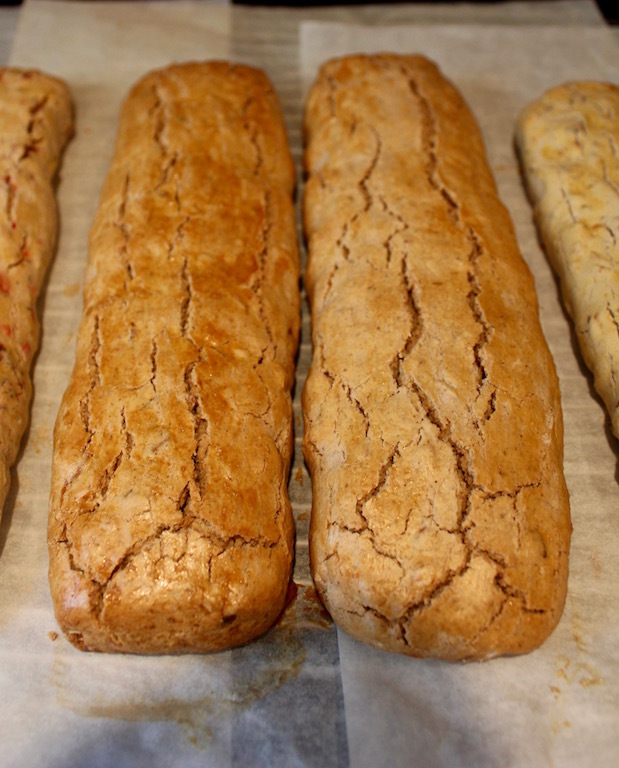 I’ve spent quite a bit of time over the last few years learning how to bake biscotti with various gluten-free flours. I thought I’d share with you what I’ve learned and the flours I like to work with. King Arthur makes gluten-free multi-purpose flour that contains both white and brown rice, tapioca and potato starches. This is a mild-flavored flour, which works well and doesn’t interfere with my flavor profiles. Bob’s Red Mill sells a gluten-free all-purpose flour that contains garbanzo flour, potato starch, tapioca flour, sorghum flour, and fava flour. The beans and sorghum have dominant flavors. In general an increase in the amount of flavorings used, such as extracts or liqueurs is needed to offset the prominent flavors of the flour. For my recipes, this was not the best choice. I can see where it would work with bread baking or as a coating on fried foods. Nuts.com offers a gluten-free all-purpose baking flour with garbanzo bean flour, potato starch, tapioca flour, whole grain sweet white sorghum flour and fava bean flour, this is also a mild-flavored flour that didn’t interfere with my flavor profiles. Almond Butter Biscotti using Gluten-Free Girl Flour and waiting 2 hours before slicing. A recent new-comer to the gluten-free flour market is Gluten-Free Girl all purpose flour blend, which contains millet, sweet rice four and potato starch. The “sticky” rice flour has a higher amylopectin content, which helps the stability of the dough. Shauna Ahern, from Gluten-Free Girl, doesn’t use any additives, such as guar gum and/or xanthan gum, in her flour and doesn’t recommend adding it. This mild-flavored flour worked well with my biscotti recipes and Shauna is correct, it does not require any additives. It was on her recommendation, that I increased the cooling time for the gluten-free recipes. Though she recommended overnight, I found a couple of hours were sufficient and had only an occasional broken biscotto, the same as the regular biscotti. This cooling technique works with the other flours, too. 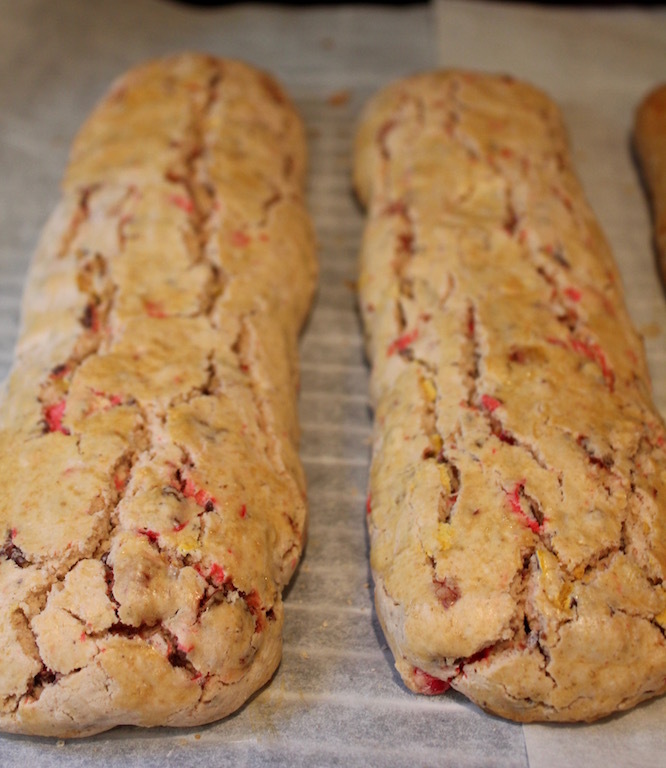 Basic Gluten-Free Biscotti Recipe with Peanut M&Ms using Gluten-Free Girl Flour and waiting 2 hours before slicing. My initial research on using gluten-free flour was a couple of years ago and it was strongly recommended to use either guar gum or xanthan gum or a combination of both to stabilize the dough. I found the best results were using equal amounts of both with the ratio of ¼ teaspoon each per cup of gluten-free flour. The only flour I trust to use for the biscotti recipes without the gums is Gluten-Free Girl all-purpose flour blend. Guar gum is a powder that comes from the seed of a legume, the guar plant. It is also a thickening agent with a high-fiber content, however, too much of this gum produces a stringy dough. Xantham gum is a polysaccharide secreted by a bacterium (Xanthomonas campestris), a byproduct of corn and is used as a thickener. Too much xanthan gum in a recipe may produce an unappealing gumminess to the dough, so measure carefully. If you want to forgo buying the gums separately, Bob’s Red Mill sells a gluten-free 1-to-1 baking flour that contains sweet white-rice flour, whole-grain brown-rice flour, potato starch, whole-grain sweet white-sorghum flour, tapioca flour, and xanthan gum. There are some other brands out there such as Cup 4 Cup, which contains xantham gum. The first ingredient is cornstarch and corn is a problem for some of my friends who are gluten-free. It also contains milk powder another common allergen. I prefer to keep to the rice grains, potato starch and more neutral flours. Alternatively, there are many recipes out there for making your own gluten-free blend. Since celiac’s disease is not an issue for us, I prefer to use pre-made blends. Use these few rules and good quality ingredients to get consistent results in your recipes. 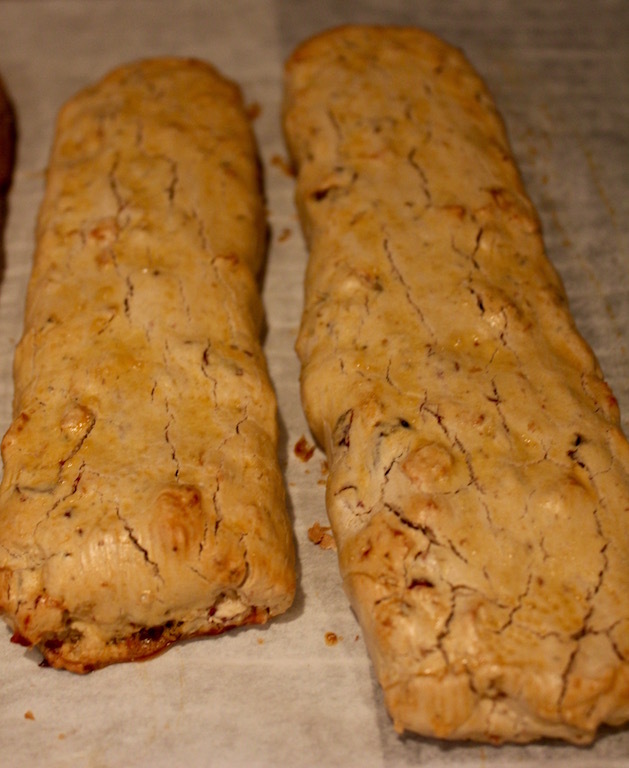 Apple Cranberry Walnut Biscotti using Gluten-Free Girl Flour and waiting 2 hours before slicing. Thanks for this info. It was recommended that I go gluten free for health reasons — nice to know I can still enjoy some tasty treats!